In the Vancouver area and the surrounding area carpenter ants are completely at home thanks to a wet climate that creates ideal conditions in homes and other structures. Contradictory to popular belief, most carpenter ants on the west coast do not require a rotten house that is falling to the ground to build their homes in. Carpenter ants are usually easy to spot when they appear in a home. The structurally damaging insects are unmistakably large usually black in colour. The challenge sometimes in identifying and locating carpenter ants is that their nests usually reside in exterior walls of a structure, showing no signs on the inside of a home. It’s always best to have a trained eye properly inspect for carpenter ants. 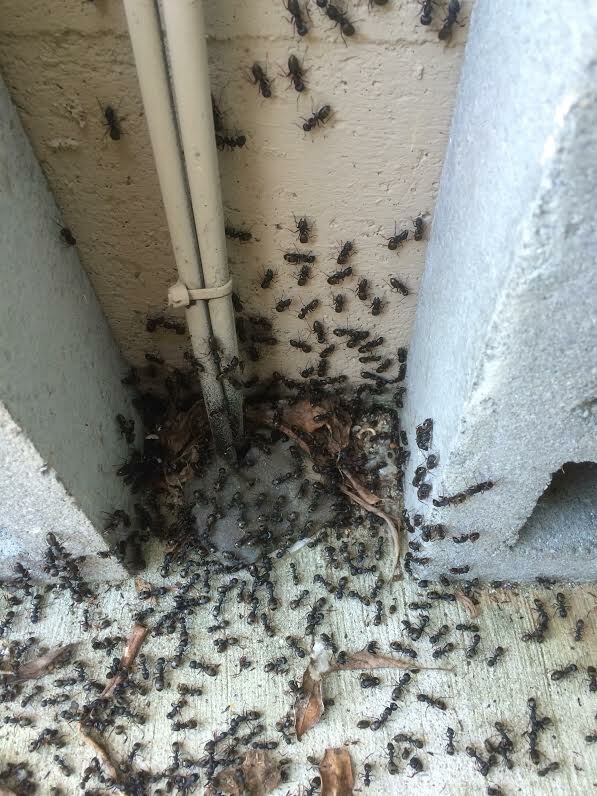 Westside Pest Control provides free carpenter ant inspections and quotes for residential and commercial structures. Ever see bits of sawdust clinging to cobwebs on the side of your house, or resting on the concrete below the fascia? 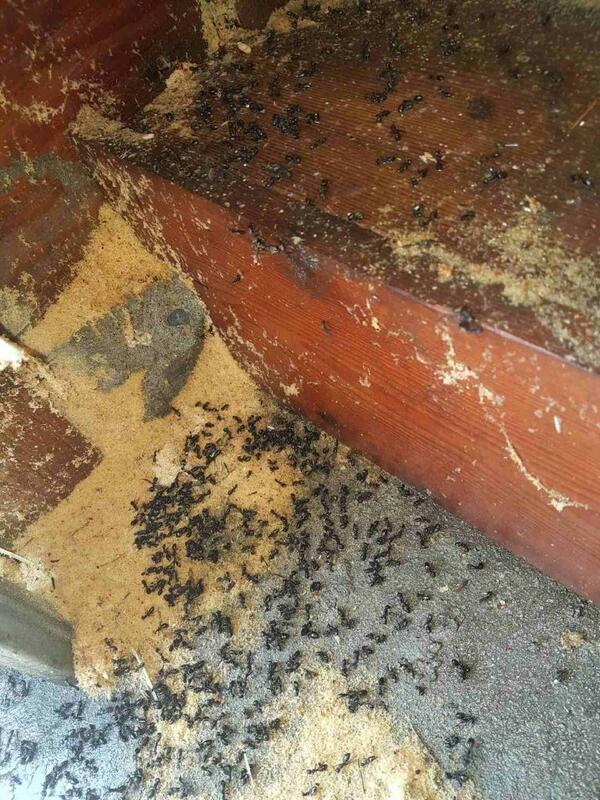 Well, bits of sawdust-like material are often an indicator of carpenter ants or termites. If it’s from either, it’s called frass, and it’s a surefire tell that one of these two pests has invaded your home. Of the two, the termites are the nastiest when it comes to wrecking your home, but carpenter ants can do significant damage as well if left to their own devices for enough time. Vicinus is quite common on the North Shore and in the Tri-Cities. This type of carpenter ant can have multiple queens and multiple parent nests. This carpenter ant, distinguished by it’s dark red legs and thorax, is very similar in appearance to it’s more common cousin, Camponotus Modoc. Don’t be fooled, Vicius is far more destructive. 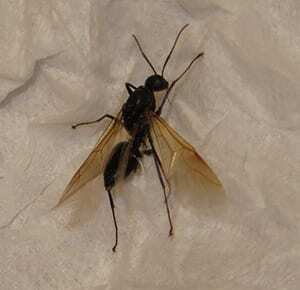 If you think you have Camponotus Vicinus Carpenter ants, contact a pest professional immediately. Westside Pest Control does free inspections. Carpenter Ant inspections can be via email or over the phone. Need Help Getting Rid Of Carpenter Ants? Speak With A Pest Expert Now! PATHS AROUND YOUR HOME COVERED IN ANTS? Westside Pest Control can help you get rid of your Carpenter Ant problem and get your home back to clean and ant-free in no time. Many of the most effective products require a trained technician who is a licensed applicator. 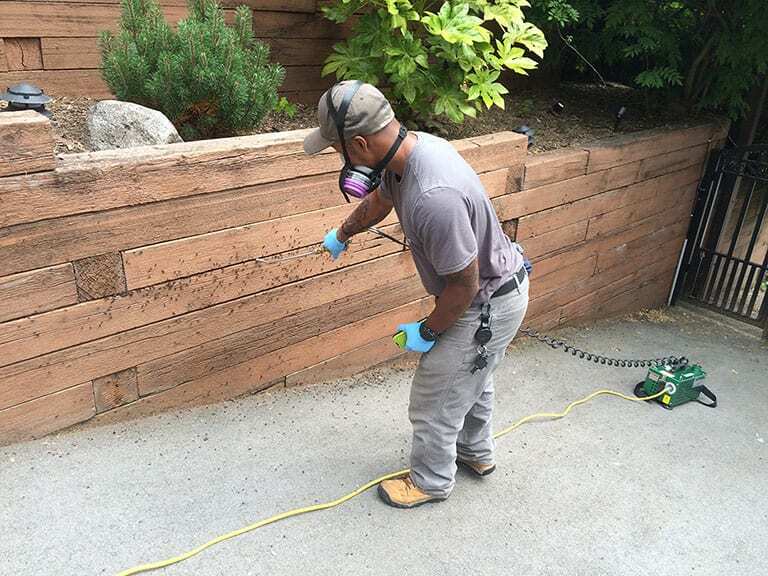 Proper care and handling is essential when treating pavements and garden for Carpenter Ants. As some of the most toxic chemicals used to eliminate carpenter ants are also toxic to humans, it’s best to call a Pest Control company to handle remove these pests on your behalf. The best way to avoid damage caused by carpenter ants is to keep your home in good repair, and to prevent opportunities for moisture to rot the wood around the building. 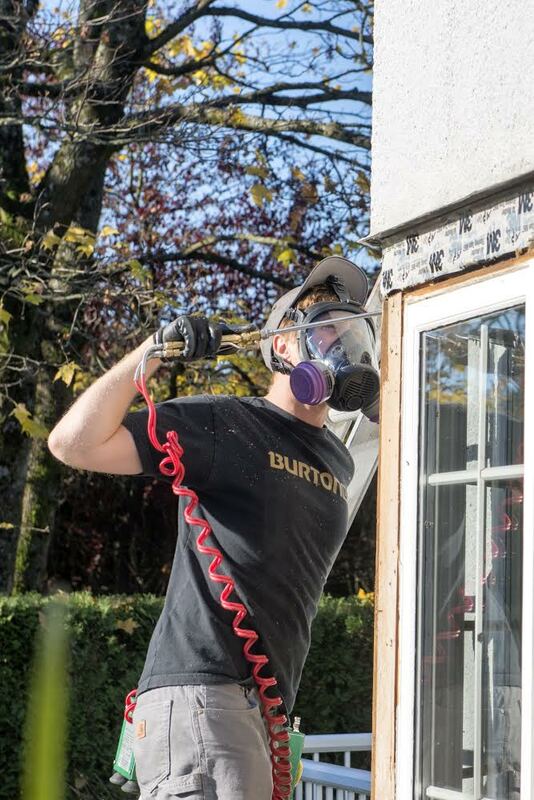 This is always a challenge in Metro Vancouver, but the good news is carpenter ants will not start an assault on your home by attacking dry wood although they will set up satellite nests in dry wood or Styrofoam insulation. The best defense is ensuring that any opportunities for moisture to do damage are minimized. Another way to prevent ants from coming near your home is to give them no excuse to do so. Carpenter ants love sweet stuff, and have a real knack for finding it. Clematis vines are really nice when they flower in the summer time but they provide a favourite tasty treat for carpenter ants, high in carbohydrates. We do not suggest you dig up the whole garden, plants and insects are very important! However, to keep insects such as carpenter ants at a distance from your home, you should also keep the food sources a short distance from the home – even if it just means the vegetation is not in direct contact with the foundation or siding. 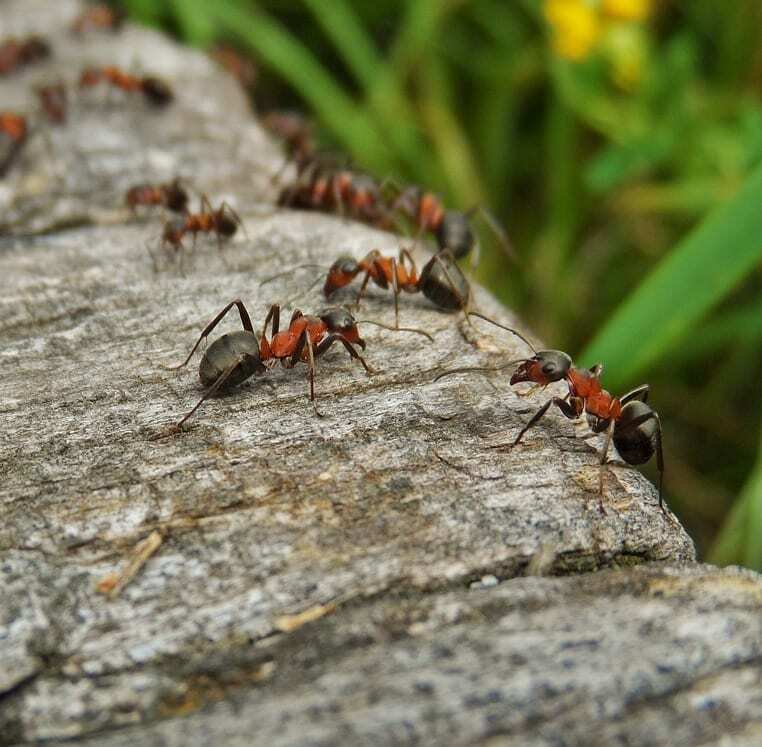 If you begin to notice lots of ants around your home, and you’re wondering whether they’re going to be a problem to the building, the first step is to identify whether they’re carpenter ants or another less destructive cousin. 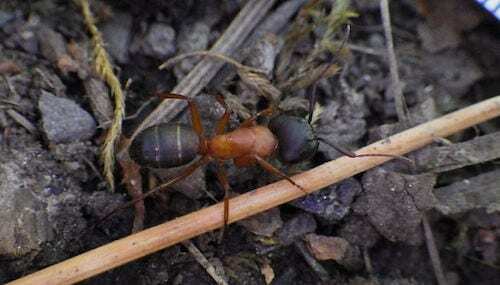 In Metro Vancouver there are two main species of carpenter ant, the all-black Camponotus modoc, and the reddish-brown and black Camponotus vicinus. Carpenter ants are larger than sidewalk ants, growing up to half an inch long. The queen ant is easily identifiable because she is bigger – up to almost an inch long. Carpenter ant workers are tireless, constantly working on building nests or foraging for food. 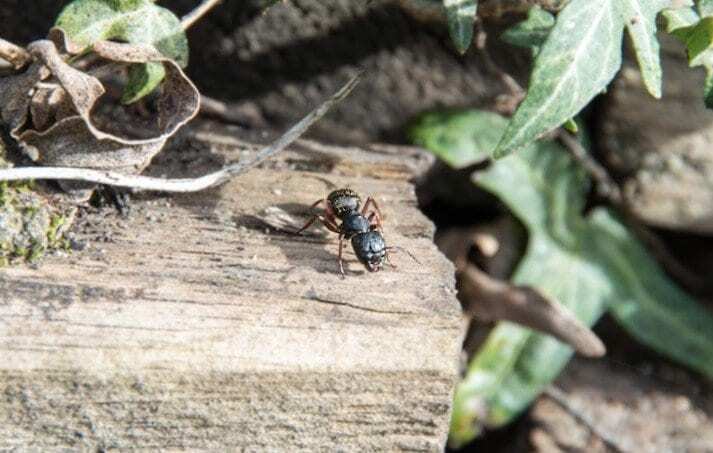 You’ll see carpenter ant workers traipsing across your floorboards, or driveway, across overhead power lines, climbing up the side of your house and of course, foraging in the garden. Carpenter ants the ones that will chew their way through your house’s wood structure. It’s interesting to note that unlike termites, carpenter ants don’t actually eat the wood as they’re not able to digest cellulose; instead they prefer dead insects, honeydew from aphids, plant secretions, and even rotting fruit. Carpenter ants in the Metro Vancouver region are generally most active between April and October (although they can groggily appear as early as late January), and the ant trails (the routes used to travel to food sources) are used most frequented by the worker ants after sunset and through the night, although they can be seen on the trails at all hours of the day. Parent nests must maintain a good level of moisture for the queens eggs to survive. A parent (or primary) nest can have many satellite nests. Satellite nest do not contain eggs and therefore do not require moisture. This enables carpenter ant colonies to have multiple satellite nests within an individual structure. 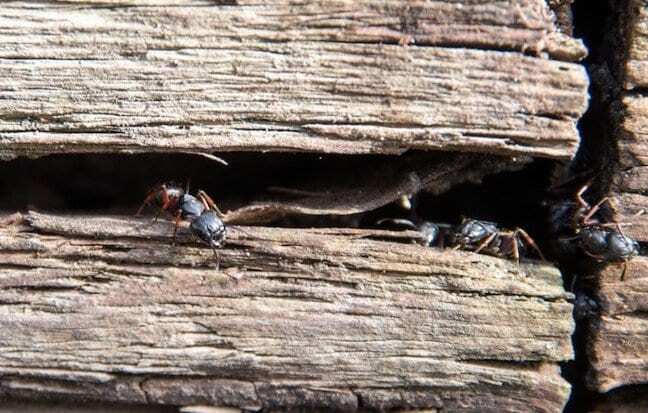 The tunnels created by carpenter ants often can’t be seen because the activity takes place inside of the wood, but if you suspect there are ants in a particular piece of wood, tap it and then listen for the tell-tale rustling sounds you can often hear if you listen hard enough – kind of a “snap crackle pop” (Rice Crispies) Oh, and if you see large, winged ants crawling out of the wood on your home, it’s as sure a sign as you can get that the ants have set up a nest. Another important tell to determine whether you have carpenter ants or termites is to have a look at the tunnels in the wood if you are able. If there’s mud or dirt in the tunnels, it means you have termites, because carpenter ants like tidy passageways. Carpenter ant colonies build a primary nest – where they lay the eggs – and satellite nests. When conditions are right – normally warm and humid – winged females and males will take flight and perform a nuptial dance. Once the mating has concluded, the males die and the new queens drop their wings, venture off in search of moist wood in which to begin a new colony. Then the new carpenter ant queen lays her first eggs and the cycle of colony building begins anew. In the Vancouver area carpenter ants are completely at home thanks to a wet climate that creates plentiful amounts of dead, wet wood… the kind of material in which carpenter ants like to make their homes. Tree stumps and old, rotting logs are perfect spots for nests, and so are building structures where moisture has been allowed to begin the process of decay that carpenter ants find so appealing. Damp wood in a home as a result of leaks from poor construction, damage to the structure, or poor maintenance is the perfect habitat for carpenter ants, which are constantly on the lookout for places to raise their young. To get to either, they burrow their way through the damaged wood, and eventually chew through newer, drier wood to get from place to place. In the process, they weaken the wood structure, which could eventually cause it to require significant repairs that will be expensive. In the absolute worst-case scenarios, the building could eventually collapse from the damage, although the likelihood is extremely minimal. Keep your home ant-free this summer. Get Westside Pest Control to come and prepare your property to fight of those ants! Wood decay may be caused by exposure to leaks, condensation or poor air circulation. Nests in homes are usually found behind bathroom tiles or around sinks, tubs and showers. Floors under leaking dishwashers create ideal conditions, as do leaks under roofing and in attic beams, or under sub-floor insulation. Hollow spaces such as doors and wall voids are good, and even foam insulation is often used. Carpenter ants will establish satellite nests and not all nests require damp wood. 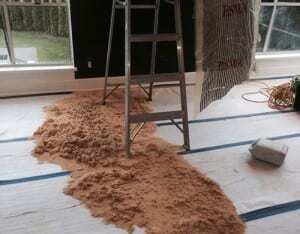 Foam insulation is easy for a carpenter ant to chew through and construct it’s maze of tunnels. Male carpenter ant reproductive. It has one purpose: mate with a female, lose his wings and die. Ready To Get Those Ants Under Control? In order to eradicate a colony, the primary nest must be detected and destroyed. You can attempt to do this yourself, or hire an expert in Vancouver, BC who knows exactly what to look for, and how to track the nest. It’s not always easy to track the ants back to their nest because they’re usually most active at night, so patience will be your biggest asset once you know what to look for. Oh, and be careful once you’ve found the nest as carpenter ants can, and will, bite humans if necessary. Biting is a defensive measure, and will only occur if the ants feel their nest and offspring are threatened. The bite can be painful, especially when combined with the formic acid they can spray into the wound to cause a burning sensation. It won’t kill you, but it can really hurt, especially if you end up with more than one bite. If you do happen to be bitten, wash the wounds with soap and water, then apply a topical antibiotic cream. Eliminating ants in Vancouver and elsewhere requires pretty much the same strategy. You have to go after the queen, the eggs and the larvae or chances are good you’ll simply exacerbate the problem. One place to start is to eliminate food sources for carpenter ants, in particular aphids. However, the carpenter ant’s “sweet tooth” will take it long distances to find aphids, giant whitefly and scales, so it’s not a highly effective means of control. There are many products available on the market for eliminating ant colonies; naturally some are more effective than others, and how you tackle the problem will depend on whether you know where the nest is or not. Spraying with insecticides or repellants isn’t the most useful way to go as sprayed-on insecticides will only kill the carpenter ants that are exposed to the killing agent, and while you may kill a bunch of them, you actually risk having the queen go into egg-laying overdrive to repopulate the colony, which could well make the original problem bigger than it was. As well, ants can sense most of the chemical repellants, so they simply learn to avoid the deadly toxins. If the spray comes too near the nest, the workers will simply move the eggs to a new location. In order to eliminate a nest, therefore, it is best to apply non-repellent borates into the wall cavities that will kill the carpenter ants within seven to 14 days after contact. The non-repellant borates work because the ants can’t detect them, and so carry the chemicals back into the nest to spread their toxicity around. If the wall cavities surrounding the nest have all been injected, then a more toxic treatment can be applied, targeting the nest location(s) only. 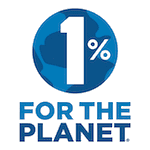 Industry experts agree that most over-the-counter options available at your local hardware store are not strong enough to be effective, as their potency is not nearly as harsh as professional-grade products. Many of the most effective products require a trained technician who is a licensed applicator. Proper care and handling is essential. If you do plan to use retail products, read the instructions carefully and follow all directions exactly. Also, be sure to check whether the product is specifically meant for carpenter ants, as not all ant-killing products are up to the challenge. To properly and effectively tackle an infestation of carpenter ants, a professional pest control program in Vancouver is essential. 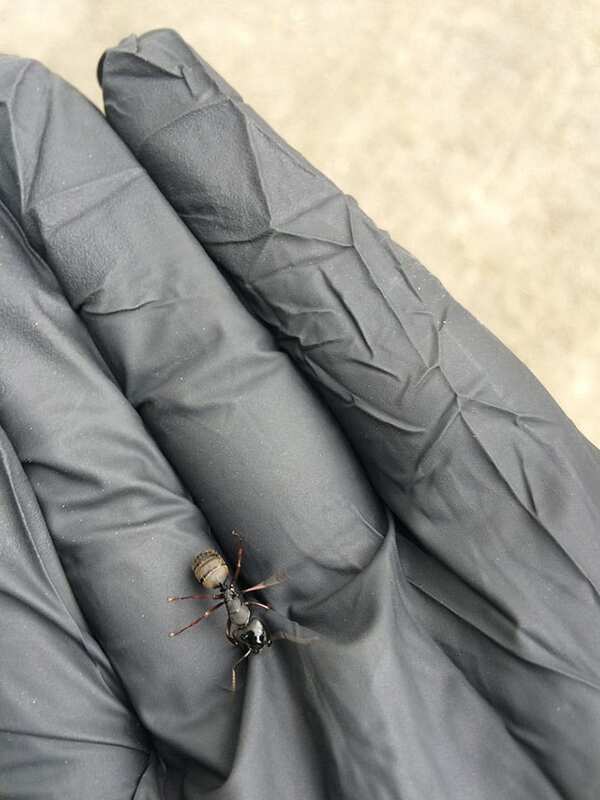 Using the right expertise, techniques and products, Westside Pest Control has been successfully eliminating carpenter ants for over 10 years. It’s important to note that eliminating a carpenter ant colony takes time, and might require more than one visit by a professional exterminator. Do you need help with Pest Control? Fill in your details for an instant call back. 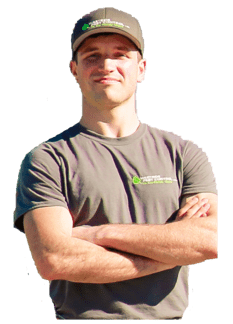 Need Help With Carpenter Ant Removal In Vancouver?